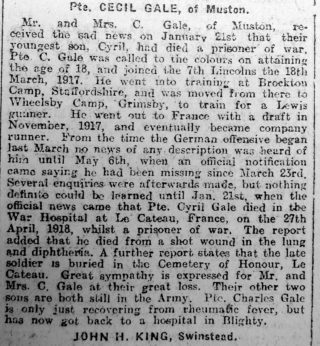 Cyril Gale was the third son of Isabella and Charles Gale. 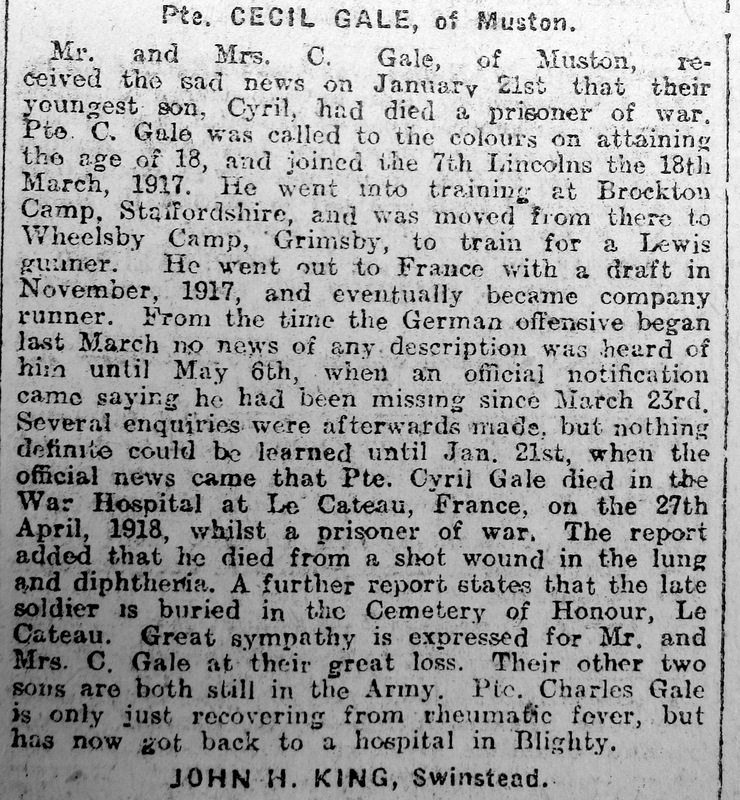 His father, Charles Gale, was born in 1872 in Muston to Christopher and Jane Uxbridge Gale. He married Isabella Pritchett, who was was born in Plungar in 1876. The couple married in Bingham in 1893, and went on to have three boys. Charles, the oldest, was born in 1894, Christopher in 1896 and Cyril in 1898, all born in Muston. They also brought up their nephew, Reginald Cecil Pritchett who was born in 1887. The family lived at Downfields Farm, Skerry Lane, Muston. Charles worked as a horseman at Downfields. By the age of seventeen Charles Jnr. was a wagoner. Christopher at fourteen had left school and found work as farm labourer. Cyril was still at school in 1911. Doubtless Cyril would have become a farm worker given the shortage agricultural labour during the 1st World War. 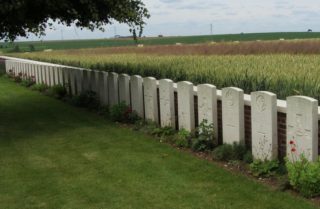 All three brothers served in the First World War. 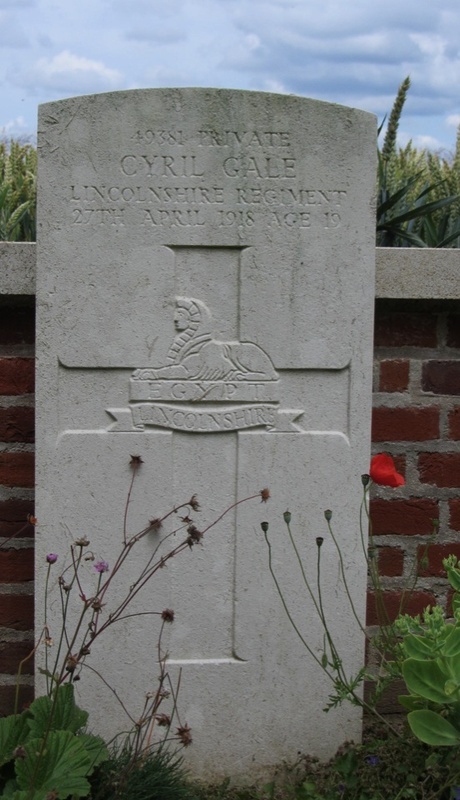 At eighteen he was drafted to join the 7th Battalion, Lincolnshire Regiment on 18th March 1917 as a Private (Service Number 49381). 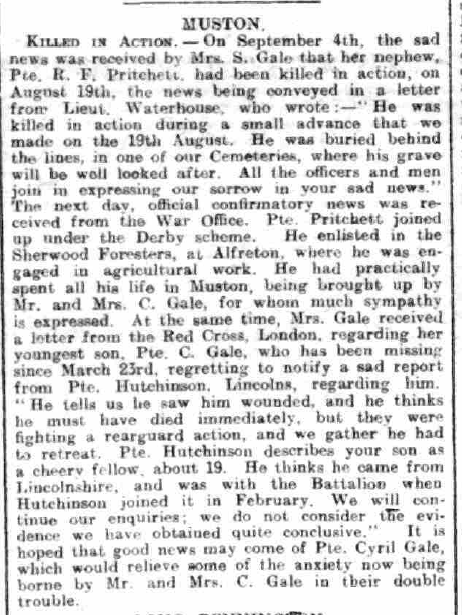 He trained at Brockton Camp, Staffordshire and then moved to Wheelsby Camp, Grimsby where he trained as Lewis Gunner. He went to France on 13th November 1917 and eventually became the company runner. He was injured during the German Spring Offensive at the end of March 1918 and taken prisoner. His family suffered extended periods of uncertainty about his whereabouts and and his well being. 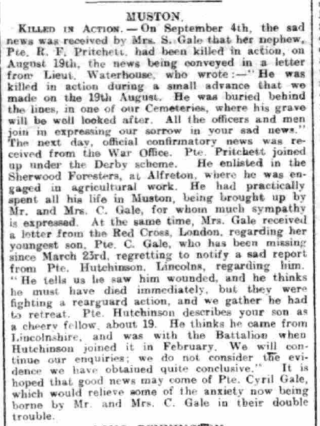 He was listed as officially missing in May 1918. 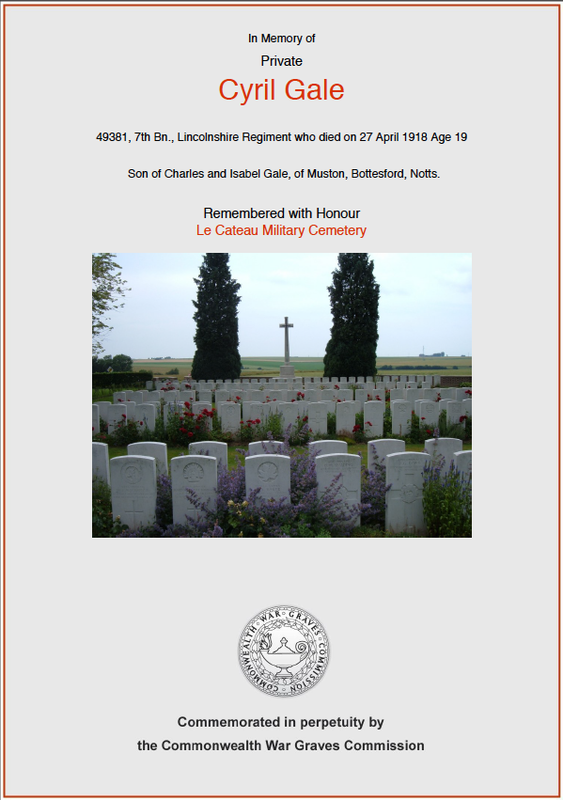 They finally heard on the 21st January 1919 that Cyril had died in the War Hospital at Le Cateau, France, on the 27th April 1918 aged 19 whilst a prisoner of war. 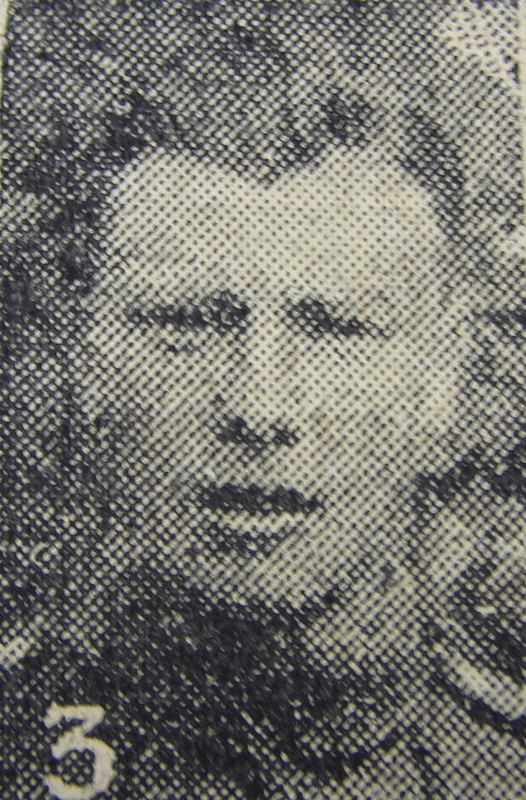 Cyril died from a shot wound in the lung and diptheria. He was buried at Le Cateau Military Cemetery. 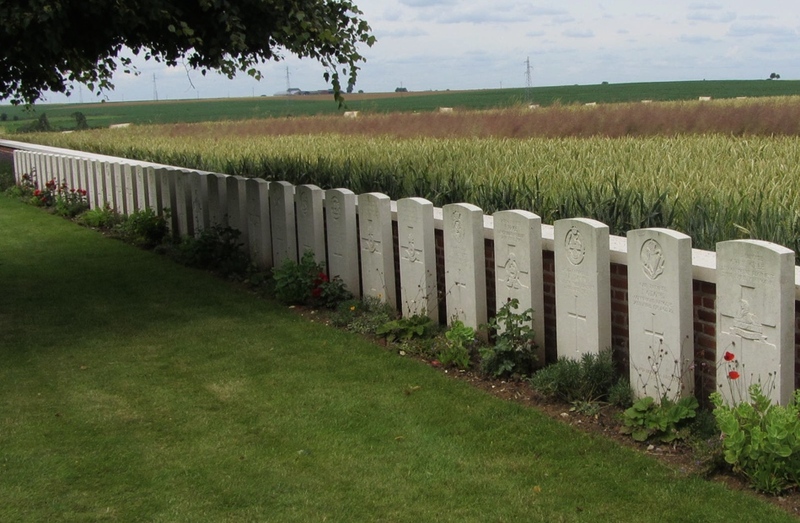 Sadly Isabella and Charles had also learned in September 1918 that Reginald Pritchett, their nephew, had been killed in action on the 19th August 1918 whilst serving with the with the 1/5th Sherwood Foresters in France. Thankfully Charles and Christopher survived.